NEXT | Have you achieved your Noblegarden goals yet? I can fly in the Broken Shore now, and it’s everything I ever wanted. I honestly forgot how much I missed it. Reminder, this weekend is a World Quests Bonus Event weekend, so get your boosted rep and hit the skies a little faster, if you haven’t already. Q4tQ: can you obliterate PVP jewelry as well, or just armor? You can, but just the Cruel Gladiator gear. The Combatant gear can’t be obliterated. I still don’t quite “get” the whole obliterating thing — it feels like every time I try to do it, it tells me I can’t obliterate whatever I’m trying to smash to bits. I think I’d be slightly more invested in doing it if I were actually min/maxing for raiding purposes. Q for the general discussion I guess: Why are there so many more ‘fill a bar’ ‘murder 27 thousand things’ WQs in the Broken Shore than there are in the rest of the Broken Isles? Is this just an extending content thing, work harder for flight thing, a lore reason in that there’s more things to kill? I guess they have the bosses up as rares rather than WQs, but I quite prefer the ‘kill a challenging enemy’ WQs over the ‘kill a thousand weak enemies’ ones. Or am I just really picky about only doing the ones that won’t take me a year to finish an emissary with and have ruined myself for fill the bar quests? I don’t think it’s a matter of there being more of the “fill the bar” type quests so much as it’s a matter of all of these new quests being concentrated in one area, rather than spread out across five pretty substantial zones. To my knowledge, there’s no real “lore” reason behind these types of quests, other than the usual “the Burning Legion is gigantic and regular swarms upon swarms of demons pop up all over the place” thing. I don’t find myself minding the fill the bar world quests so much, mostly because there’s usually a few different ways to fill the bar — you can kill mobs, sometimes you can destroy items or free things from cages. There’s enough of a variety that it feels like my stick-to-the-shadows sneaky Rogue can either go on a murder spree, or just sneak around and click stuff if I don’t feel like trying my hand at AOE on any given day. That said, I still prefer the “kill one named mob” variety, just because it’s faster. Q4tQ: Who would emerge the victor in a fistfight (meaning no magic allowed) between the historical imperators and sorcerer kings of the ogres? Molok, Hok’lon, Kelgrok, the unnamed warlord from Lords of War or Mar’gok? I’m not including Gog Gronnslayer because he would probably rek everyone else. No magic at all? Gorgog would be the automatic winner in that one, but if we’re counting him out I’d say probably Molok. He was a sorcerer, yes, but he also ruled far enough back that he probably didn’t rely as heavily on spellwork as later Imperators might have. While he probably didn’t rely on his fists as heavily as your run-of-the-mill ogre, I’m guessing he was still at least more familiar with punching than later Imperators. 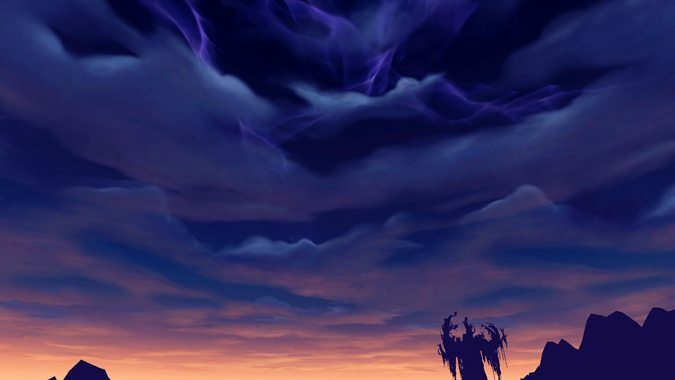 With the Kirin Tor world quests, Fly Like the Wind and the one where you go into the bubble are now negated with flying. And the one where you ride the ley saber cat seems odd, as flying would be more beneficial than running. Do you think it’s time there was a new type of Kirin Tor world quest that involved having a flying mount? Well ley saber cats don’t fly, and you’re trying to gather nodes specifically with and for the kitties, so flying really wouldn’t make sense in that aspect. I don’t think they really need to introduce a flying mount specific World Quest, particularly since not everyone has flying yet — and heck, some people might be ignoring the grind for flying altogether. You don’t need it for anything, it just makes things more convenient. The moment you put in a World Quest that requires flying, you’re essentially locking out all those people that chose not to fly. That doesn’t feel good at all. Having an advantage because of a flying mount is vastly different than requiring a flying mount, you know? Q4tQ: what is your own idea of what D4 should be story wise? The series has gone from ‘brave mortals hunting the prime evils’ to ‘nephalim shaped wrecking ball demolishes heaven and hell’. I see nephalim army washes over heaven and hell. Which appeals to me as an allegory of humanity conquering it’s own superstitions. Or, Blizz’ throws a curve ball, and the new player classes are angels and demons fighting the ascendant nephalim faction. I actually really like the idea of angels and demons fighting the nephalem — I mean, it’s the logical place for that story to go. At the end of it all the nephalem could be beaten down entirely, kind of starting the cycle anew as it were. However, it’s also the most obvious place for that story to go — which makes me think Blizzard wouldn’t really go that route.